Bryce Higgins, a member of the Troopers, sent these photos. My name is Bryce Higgins. I am 19-years-old and will play baritone for the Troopers in 2007. 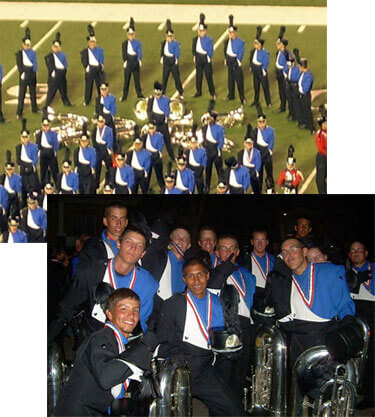 I was in the front ensemble in 2005 and originally planned on taking the 2006 season off. After getting an offer to march as a member of the Blue Stars as a baritone player in 2006, I am glad I did because the Blue Knights tuba section shaped the famous "cross sabres" on the field during the World Championship Finals retreat. The idea was Mark Feuerborn's, who marched as a contra player with the Troopers in 2004 and 2005. He let Mark Crimm, the Troopers' drum major, in on the plan and was one of the few people to know about it. I am glad I marched in 2006 because I would not have seen this great sign of respect unfold before my eyes. Mark Crimm, Mike and Michelle Ottoes, Fred Morris and myself were all deeply moved by the event and I must say that the 2006 Blue Knights tuba section is one of my favorite groups of people ever. After retreat, I asked the section if I could take a picture.